On the market, consumer products of collagen peptide are in liquid packaged in plastic or glass bottle. Such products are heavy (liquid), expensive/ difficult in transportation (brittle, leakage), and require careful preservation (bacterial growth). Recently, powder products are popular because of the above problems. However,cost of energy increases because of all the liquid ingredients are spray-dry individually, and then mixed together.Cost of man powder, handling and transportation increase as well.In addition, the natural juice powder on the market contains very little juice, they could contain maltodextrin, flavoring and coloring. JELLICE is able to mix all liquid ingredients, including collagen peptide liquid, and spray dry together.The supplier and traceability of produce is enhanced and simplified. The mixture does not contain any artificial coloring and flavoring. The juice content can reach 20%. Reduce Spray-Drying, Handling and Transportation. 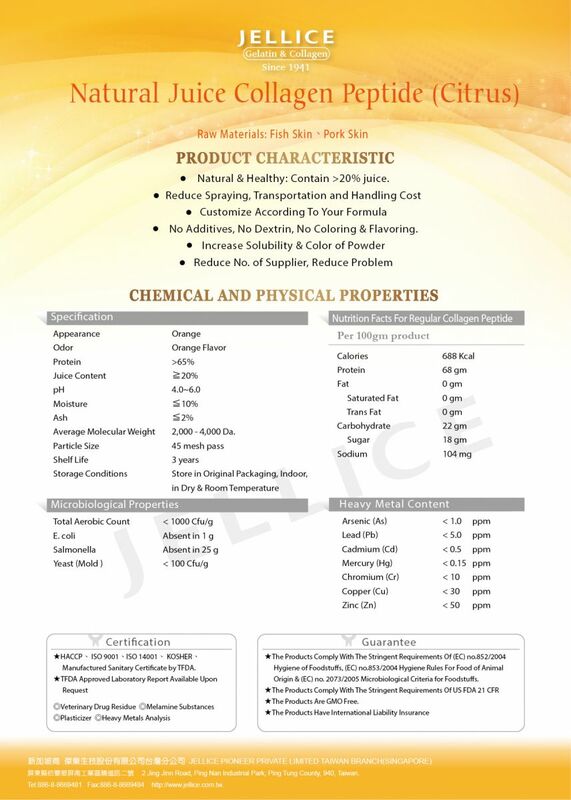 JELLICE is able to custom-made collagen peptide from exotic origins such as shark, salmon, bass, frog ...etc. Collagen peptide is a major ingredient of supplement and functional food, and daily dosage is 4-12g. Regular collagen peptide contains ~2000ppm (mg/kg) of Sodium, daily consumers and elderly with cardio conditions should be careful. 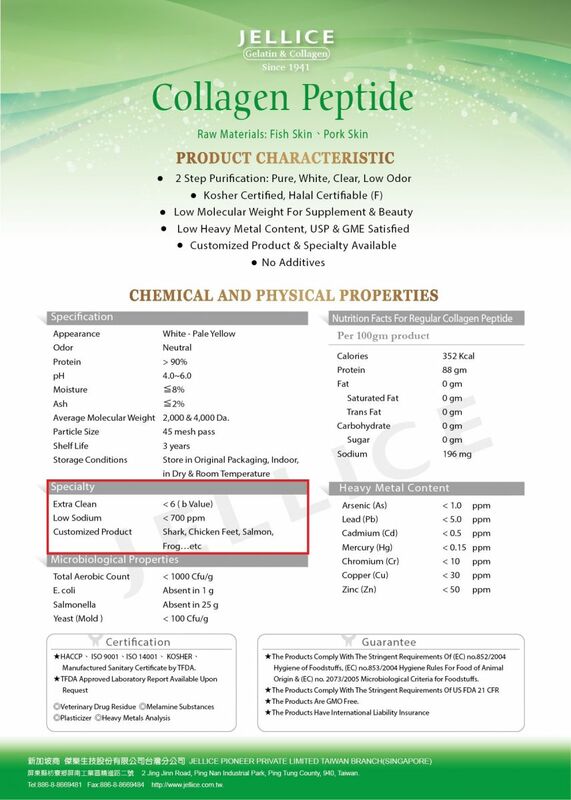 JELLICE Low Sodium Collagen Peptide contains only ~560 ppm of sodium (56mg/100g).It is consider LOW SODIUM (Taiwan Food and Drug Association). A highly purified type of collagen peptide that is especially white in color, low odor and taste. It is suitable for cosmetic and lotion that requires a "Pure/ Natural" appearance. In addition, It reduce the cost of product by lowering the use of coloring and flavoring.